An airy oasis amongst the urban landscape. Classic glamour bathed in cutting-edge refinement. Modern luxury woven through traditional Milanese design. An ever-changing city that inspires exploration and innovation. The capital of fashion and design. An emblem of classic charm and spirit. All waiting to be discovered. The true Milan, with Italian spirit in every detail. Really being in Milan is so much more than geography. 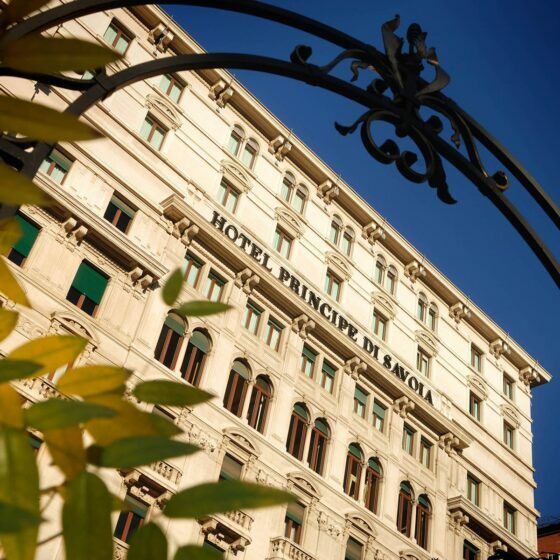 At Hotel Principe di Savoia the design of your room invites you to immerse yourself in the authentic vitality of this stylish city. The city’s landscape evolves around us, providing an endlessly exciting and vibrant view. But the sun still hits the rooftops with a very particular sheen. Milan’s ancient beauty always shines through. The fitness centre offers its own, unique brand of treadmill motivation. The sensational view and glamorous terrace are quite something to behold as you run across rooftops. Our lovely city has recently acquired a hive of cool and contemporary design. Porta Nuova will show you a refreshingly different side to Milan. Everyone at Hotel Principe di Savoia takes great care in offering our guests a memorable time and making them feel at home. Nothing is left to chance and every small detail is important. The streets that flank the hotel are all named after Italian explorers, philosophers and scientists. This spirit of adventure is mirrored by the hotel’s dedication to innovation. This is the place to begin your own Milanese adventure. Milan is a hidden gem, a treasure trove waiting to be discovered. Our concierge team have the map to all secrets and the key to open them up for you.